Join the Teletubbies this Holiday Season! CULVER CITY, Calif. (November 1, 2016) – A whole new generation of families can enjoy the iconic Teletubbies when TELETUBBIES: SNOWBALL debuts on DVD December 13 from Sony Pictures Home Entertainment. Featuring six all-new episodes, the cherished pre-school program follows the adorable antics of Tinky Winky, Dipsy, Laa-Laa and Po as they play, learn, dance and explore the magical world of Teletubbyland. Teletubbies has been updated and reimagined in a brand-new series produced by DHX Media, with fun, new elements including the Tubby Phone and new Touch-Screen Tummies. Just in time for the holidays, TELETUBBIES: SNOWBALL features the Teletubbies singing “We Wish You a Merry Christmas”, as well as a behind-the-scenes featurette for grown-ups to enjoy along with their little ones. It’s a cold day in Teletubbyland and snow falls on the Teletubbies! Join Tinky Winky, Dipsy, Laa-Laa and Po as they find big snowballs, dance with a snowman and watch children make a caterpillar out of snow. Contains six brand new episodes including ‘Snowball’. 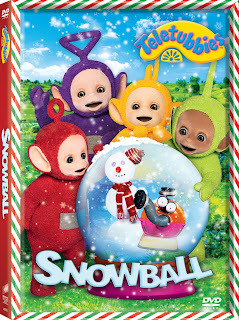 TELETUBBIES: SNOWBALL has a run time of approximately 74 minutes. The collection is not rated. Originally created in 1997, Teletubbies is one of the most successful global children’s brands of all-time. Targeted at young preschool viewers, it has reached over 1 billion children to date. The original episodes have aired in over 120 territories in 45 different languages. Teletubbies is produced by DHX Media. DHX Media Ltd. (www.dhxmedia.com) is the world’s leading independent, pure-play children’s content company. Owner of the world’s largest independent library of children’s content, at more than 11,800 half-hours, the company is recognized globally for such brands as Teletubbies, Yo Gabba Gabba!, Caillou, In the Night Garden, Inspector Gadget, Make It Pop, Slugterra and the multiple award-winning Degrassi franchise. As a content producer and owner of intellectual property, DHX Media delivers shows that children love, licensing its content to major broadcasters and streaming services worldwide. Through its subsidiary, WildBrain, DHX Media also operates the largest network of children’s content on YouTube. The company’s robust consumer products program generates royalties from merchandise based on its much-loved children’s brands. Headquartered in Halifax, NS, DHX Media has offices in 15 cities globally, and is listed on the Toronto Stock Exchange (DHX.A and DHX.B) and the NASDAQ Global Select Market (DHXM). TELETUBBIES and all related titles, logos and characters are trademarks of DHX Worldwide Limited. ©2016 DHX Worldwide Limited. All Rights Reserved.